From what rises ambition? Or love? Why can’t some of us be content with the lives we’ve been given? Why do some yearn for so much more? Tom Pryce wanted to drive cars, fast, and couldn’t be stopped by the perils of the sport. He was on a seemingly impossible quest for greatness, yet by no fault of his own, he lost his life in the attempt. Thomas Maldwyn Pryce was born on 11 June 1949 in the little town of Ruthin in the north of Wales. Tom’s father had served as a tail gunner on a bomber plane during the Second World War, after which he became a local policeman, while Tom’s mother worked as a nurse. Tom grew up being an only child, as his brother died at the young age of 3. Initially, Tom wanted to become a pilot like his father but didn’t get the grades in school. His interest in cars had been sparked at the age of 10, when he took a job at the local bakery, driving the van. Pryce dropped out of school at 16 and took a job as a tractor mechanic, but his aim was to become a Grand Prix racing driver like his childhood hero Jim Clark. When Pryce turned 20, he joined the British Racing School. Former Grand Prix racing driver Trevor Taylor taught him how to race, first at Mallory Park, then at Brands Hatch. Pryce proved a quick learner, and quick on track too. Pryce left his job and his native Wales and moved nearer to Brands Hatch. In 1970, driving the lightweight and cheap Lotus 51, Pryce won a series specially set up for racing pupils, and in 1971 Pryce raced both Formula Super Vee and Formula F100, dominating the latter with 8 wins from 20 races. In 1972 Pryce remained in Formula Super Vee, clinching the championship. Pryce also drove in British F3, winning his debut race at Brands Hatch. Bob King, his team manager said: “They stripped the car down afterwards. They thought we had a bent engine, they thought we were underweight. But they pulled it apart and found it all legal and that Tom was just extremely quick.” Yet the rest of Pryce’s season was plagued with mechanical issues. Things went worse in a practise session at Monaco, when Pryce’s car stopped at Casino Square with yet another issue. Pryce stepped out of the car and fiddled with the engine. Another competitor lost control of his car and crashed into Pryce, throwing him into a shop window. Pryce escaped with only a broken leg and was back in the car five weeks later, clinching pole position upon his return. He finished the season in 9th place. Pryce competed in the 1973 British Formula Atlantic season. 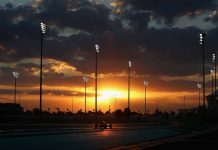 He firmly led the championship after winning its first three races but ceased his championship bid when Ron Dennis approached him to race for his prestigious Formula 2 team. Pryce joined mid-season and scored a second place at the Norisring. Ron Dennis, on the back of his team’s success in Formula 2, then planned a Formula 1 team to be named Token and to debut in 1974. But the start was scrappy, and while already running late for the season, main sponsor Motul left and a new investor had to be found in order for the car to be finished. Pryce drove in the non-championship race at Silverstone but the Token RJ02 was incomplete, running without an airbox or engine cover. Pryce was well off the pace, but somehow the team found encouragement and entered Pryce for the Belgian Grand Prix, his and the team’s first championship race. Pryce did qualify but retired after colliding with Jody Scheckter’s Tyrrell. Pryce was also set to drive at Monaco but was refused entry by the organisers for being too inexperienced. Pryce then found a seat for Monaco’s Formula 3 support race, which he dominated, winning by over 20 seconds. Pryce’s F3 performance impressed Shadow’s team manager Alan Rees, who felt that Pryce possessed a rare talent. His team was looking for a proper replacement for their driver Peter Revson, who had lost his life in a testing accident at Kyalami earlier that year. Pryce gladly joined Shadow to leave the ailing Token team. Pryce fitted right in the Northampton-based outfit and bonded well with the mechanics. Rees tutored Pryce and made him unlearn his oversteering and opposite-lock enthusiasm, and turned him into a smooth driver. “But it feels so slow“, Pryce said, but the time sheets said otherwise. Pryce got his first points with a 6th place at the German Grand Prix at the Nürburgring. Pryce also qualified impressively in 3rd position at the French Grand Prix but retired after colliding with Carlos Reutemann’s Brabham and James Hunt’s Hesketh. As Token folded before the end of the 1974 season, Pryce finished the driver-standings in 18th place. During the 1975 season, Pryce became the first Welshman to win a Grand Prix, albeit a non-championship one. At Brands Hatch, he qualified on pole and won after fierce battles with Ronnie Peterson and Jacky Ickx. Pryce showed the world his talent at championship races too. He sensationally qualifying in 2nd for the Monaco Grand Prix, but during the race, he clipped the barrier and had to retire. The similar disappointment came at Silverstone, where Pryce scored his first pole position. Pryce led the race but was one of the first to slide off the track when the rain started. But Pryce did score his first podium at the Austrian Grand Prix and collected points in Belgium, the Netherlands, Germany and Italy, ending the season in 10th place. At the first race of the 1976 season Pryce instantly collected a podium finish in Brazil, but when car regulations were suddenly changed, Shadow lost much of their competitiveness as they had to lower their airbox and move their rear wing forward. The season was thus somewhat of a disappointment; Pryce only scored points in the British and Dutch Grand Prix, ending the season in 12th place. Teammate Jean-Pierre Jarier scored no points all season and left Shadow for the newly formed ATS team for 1977. Pryce meanwhile was approached by Colin Chapman to join Lotus for 1977, but Pryce hesitated, as he felt loyal to the Shadow team, and little did anyone know about Lotus’ ground effect that would storm the 1977 and 1978 seasons. Pryce remained with Shadow and was firmly its top man for the 1977 season. The team ran into financial troubles and was forced to hire the Italian pay driver Renzo Zorzi. The 1977 Shadow wasn’t a top car, but Pryce showed how good he was in the opening race in Argentina, but retired from the lead pack with a gearbox failure. 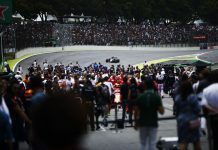 Pryce ran in 2nd place during the Brazilian Grand Prix, but again was forced to retire, this time with an engine failure. And then came the South African Grand Prix at Kyalami. Pryce set the fastest time in Wednesday’s practice session but qualified only in 15th. Upon lights out, Pryce had a terrible start and ran last after the first lap of the race, but moved back through the field. By lap 18, Pryce had moved from 22nd to 13th place. Yet on lap 22, one of Formula 1’s most sickening accidents unfolded. Pryce’s teammate Zorzi stopped on the left side of the crested start-finish straight with an engine failure. The Shadow caught flames and two marshals on the opposite side of the track climbed over the pit wall carrying fire extinguishers, to dose the harmless fire. Just as the two started their sprint across the track, Hans-Joachim Stuck and Tom Pryce blasted through the final corner called ‘The Kink’ and started their blind ascent towards the start-finish straight. Stuck missed the first marshall by mere millimetres and swerved right to avoid the second marshall. Pryce was following Stuck so closely that had no time to react as Stuck’s car dashed right. Pryce’s Shadow hit 19-year-old Frederik Jansen van Vuuren head-on at 270 kilometres an hour. Van Vuuren’s body was thrown in the air, while the 18-kilogramme fire extinguisher hit Pryce full in the face. Like Van Vuuren, Pryce was instantly killed. Pryce’s helmet was torn off by the impact with the extinguisher, which then sheared off the rollover bar of his Shadow, parts of which hit Lauda’s Ferrari. The Shadow with Pryce motionless in it still travelled at high speed, Pryce’s foot still on the accelerator. It scraped the barriers and flung back on the track, hitting Jacques Laffite’s Ligier. The two cars slammed into the barriers. As the dust settled, only Laffite climbed out of his car. Niki Lauda won the race, his first win since his near-fatal crash at the Nürburgring in 1976. Initially, he labelled it the greatest victory of his career, but all that joy vanished after he heard about Pryce’s death. Pryce was only 27 years old. Ahead of his last race, he said to a journalist: “I am frightened of death, for what it might do to those I leave behind.” Pryce’s wife Fenella was watching from the grandstand when the tragedy happened. Tom Pryce was buried in the village of Otford, in Kent, near the church where he and Fenella were married two years earlier.